Connor read The Lost Castle Treasure all on his own. As we approach the end of another year, and people start thinking about gifts for their loved ones, I have cause to reflect back over my journey with Cardboard Box Adventures Publishing these last 6 years. When I published my first Cardboard Box Adventures picture book in 2009, The Tortoise and the Hairpiece, I had all the trepidations of a first-time author. My objective with my picture books was to encourage the kind of lap-reading I enjoyed with my grandmother, and to help parents engage children in conversation with questions at the back of the book. Since then, with 10 picture books and two chapter books on the shelf and with a third chapter book in the works, I’ve been touched and grateful to receive abundant feedback and photos from readers and reviewers about their experiences with Cardboard Box Adventures books. One of my favorite quotes is from the Family Review Center, who awarded my picture book, Superhero, Best of The Year in 2014. These gifts of feedback are very precious to me as a writer and publisher and make any continued efforts on behalf of my readers a joy. Here are a few of the heartfelt words of appreciation from some of my readers, along with some reader-supplied photos. Sarah, whose 8-year-old son Jack is a struggling reader, shared that he didn’t want to stop reading his Sir Kaye, the Boy Knight book, The Knighting of Sir Kaye. Reluctant to set it aside for dinner, he ate as quickly as possible so he could dash back up to his room and read until bedtime. He did so, brought the book to the breakfast table the next morning, and continued reading in the car on the way to school. Upon completion of the book the next day, he bubbled over with excitement as he shared favorite plot twists with his parents, lamenting the fact that the book was finished, and eagerly asked if the second book in the series was out. Such was his enthusiasm that The Knighting of Sir Kaye was the first chapter book Jack had ever read all by himself, without prompting. Camilla enjoys The Watch Cat. Emma, 12, suffers from dyslexia, and was so encouraged to know that dyslexics can become not just proficient readers but writers, that she has started keeping a journal with story ideas. 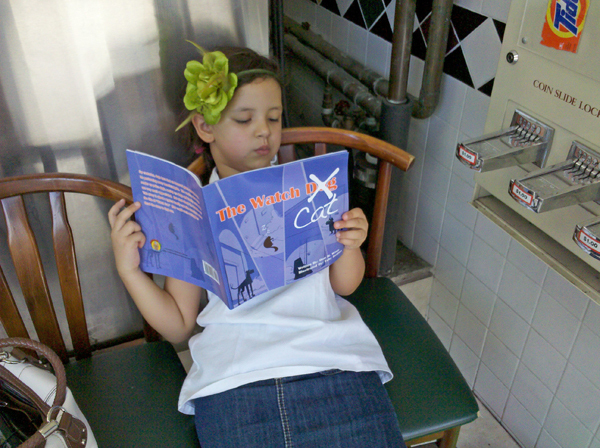 She is especially fond of the anthropomorphic story lines from the CBA picture books, and is writing stories about her guinea pig. 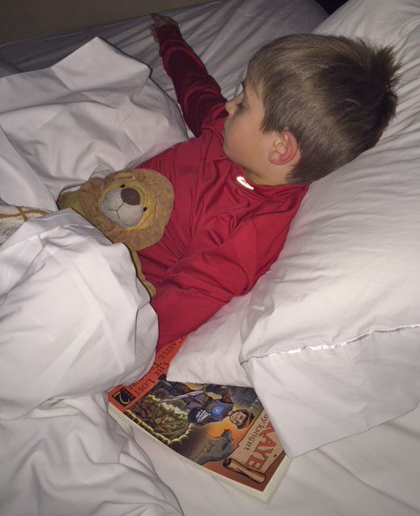 Michael, an 8-year-old boy with autism, loves his rhyming picture books so much that each night before bed he wants to hear the stories of his beloved characters, and listens to his audiobook version of the story compilations so he can go to sleep dreaming of his favorite friends. 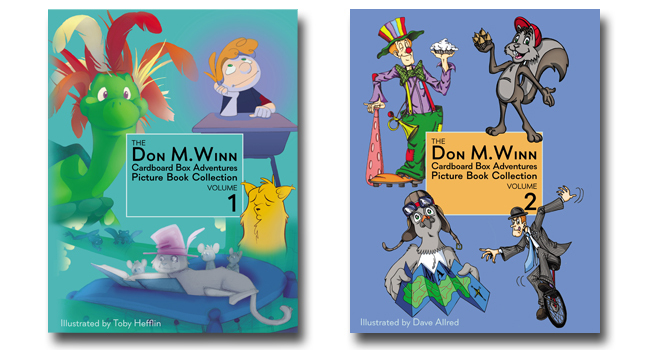 Sign up for my (Don M. Winn’s Cardboard Box Adventures) free email newsletter and be the first to get the latest news and happenings at CBA Publishing. Click here to sign up. 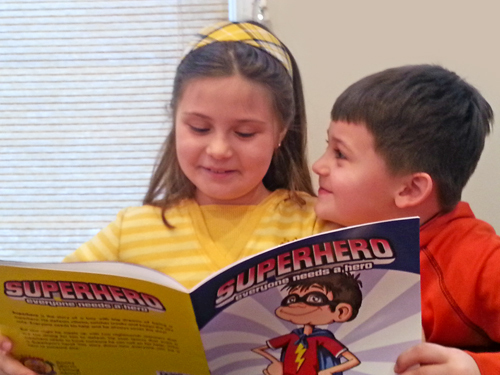 Ben and Sophie took some time together to read Superhero. What has Cardboard Box Adventures Publishing been up to over the last year? 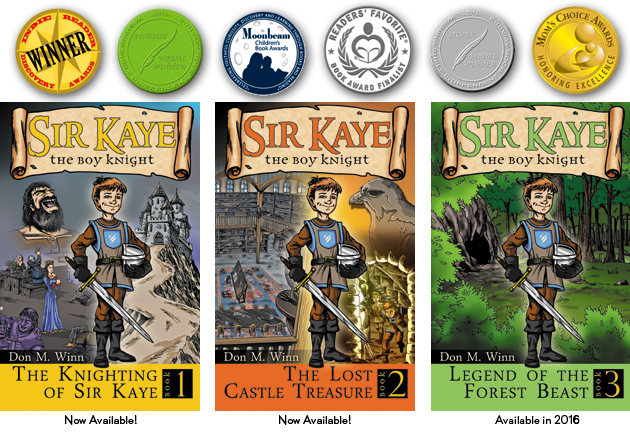 The Lost Castle Treasure, the second book in the Sir Kaye, the Boy Knight series to follow the award-winning first book, The Knighting of Sir Kaye, was published along with the audio edition. The third book in the series, Legend of the Forest Beast, is well underway along with simultaneous development of the fourth book in the series that will conclude the four book story arc—but not to worry, there will probably be more standalone Sir Kaye adventures after book four. Begin the adventure with the first book in the series, The Knighting of Sir Kaye and then follow up with second book in the series, The Lost Castle Treasure. Read more about the series along with a sneak peek of both books at About the Sir Kaye Series. Available from Amazon, Barnes and Noble, the iTunes Store, and Audible. This year we also published two picture book collection volumes with 4 picture books in each volume. Volume One contains the award-winning stories The Tortoise and the Hairpiece, The Incredible Martin O’Shea, The Watch Cat, and Shelby the Cat. Volume One also has an audio book companion available from Audible.com. Volume Two contains the award-winning stories Chipper the Clown, Chipper and the Unicycle, The Higgledy-Piggledy Pigeon, and Twitch the Squirrel and the Forbidden Bridge. Available from Amazon and Audible. 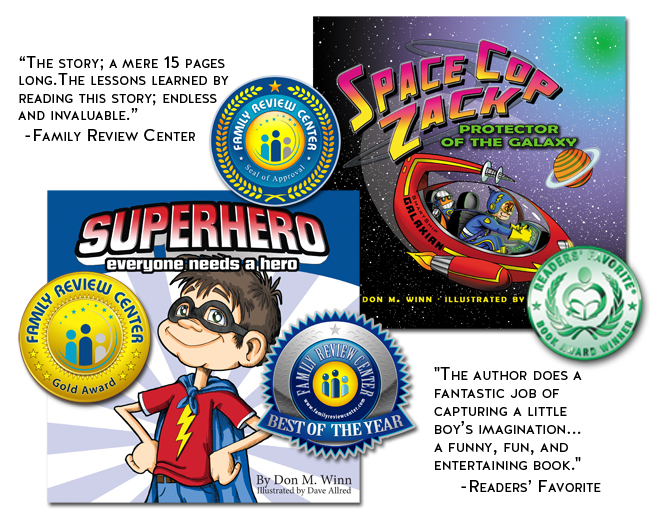 Don’t forget Superhero and Space Cop Zack, Protector of the Galaxy, very popular, multiple award-winning books which are not included in either of the picture book collection volumes. If you have not yet read any Cardboard Box Adventures picture books this is a great time to do so. 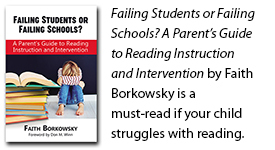 As individual books or as a collection, each story has a fun teaching theme that parents can use to illustrate important life lessons as well as questions for discussion. For a list of topics contained in each CBA book check out the Lesson Reference Guide. My picture books and the Sir Kaye the Boy Knight chapter book series for middle readers make great gifts and are available as softcovers, hardcovers, and eBooks from Amazon, Barnes and Noble, and the iTunes store, as well as your other favorite online retailers. Don’t forget to sign up for my free email newsletter and be the first to get the latest news and happenings at CBA Publishing. Click here to sign up. 5 Harmful Misperceptions About Dyslexia—Spread the Word! i love superhero…. hmm thanks for u sharing. like that its so useful.. thanks for ur sharing. Thanks Kardus, I’m glad you like it.